aGupieWare: Electroadhesion: How Does That Grab You? According to theverge.com, the GrabIt company has created mechanical "hands" that use electrostatic attraction to lift and relocate objects. Electrodes embedded on the gripper's surface or in its flexible "fingers" use the forces to delicately deliver everything from sheets of glass to crates. Even particularly fragile tech items like an iPad are safe in static electricity's grip, and bruisable items like fruit or poppable bags of chips are also no problem for "electroadhesion." One version of a GrabIt robot's grip ability. It's bigger, flatter brother can pick up large crates. 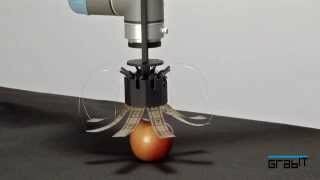 With no reconfiguration of gripper parts needed (as traditional grabber/sucker robots might require), the possibilities for electroadhesion are vast. Check out GrabIt's website for a variety of videos of what their technology is capable of. The machines' electrostatic surface area generates and maintains a great deal of well-dispersed power, making larger objects as easily handled as smaller or more delicate ones. The technology could even be applied to conveyor belts for an added level of factory security. Best of all, the electroadhesion technology requires less power than traditional gripper robotics. The GrabIt 'bots don't require expensive vacuum tubes or pumps, which is nice not only on the wallet but also on the ears (this technology is considerably more quiet than other types of grippers.) It's small enough to be useful at home, but strong enough for factory work. Could one of the most useful pieces of future robotics be a technology that's basically just giving everything an electrostatic hug? Everything can use a little grabbing sometimes.